A recent transplant from Florida, I am constantly astounded to see mountains on the horizon. I’m even more astounded that I live in a city with a subway. My auto-oriented childhood made me dream of a different transportation reality, one where people buy bus passes instead of cars, where every neighborhood comes with a park, and where cities approve pedestrian promenades instead of parking lots. While my hometowns of Tampa and Orlando have come a long way, there’s ample work to be done. I believe our world is a more compassionate place when well-designed streets beckon people to walk, bike, or ride transit; and when well-placed public spaces invite people to linger. I am proud of working with Alta to help make that world our reality. 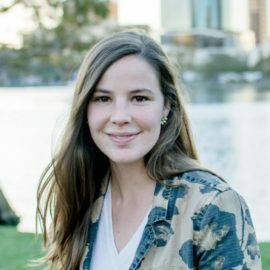 After majoring in Environmental Studies at Rollins College, Courtney joined the Florida Department of Transportation’s regional commuter assistance program as an outreach specialist for Central Florida. Later, she flexed her government relations skills as a planner for the local school district where she analyzed mode splits of district schools. Her most recent endeavor involved an eight-month journey exploring urban design, mobility, and public space around Asia and Europe with the Homage Project. Witnessing Hanoi’s rivers of motorbikes, Osaka’s narrow streets, and Utrecht’s red bicycle highways redefined her sense of what is “normal” for mobility, and has inspired innovation and new perspectives in her work as a planner. When not at work, Courtney can be found summiting the Hollywood Hills (which really are mountains to her), making switchel, and admiring the particularly tall Los Angeles palm trees.